Crown Prince Frederik of Denmark celebrates his 50th birthday today. 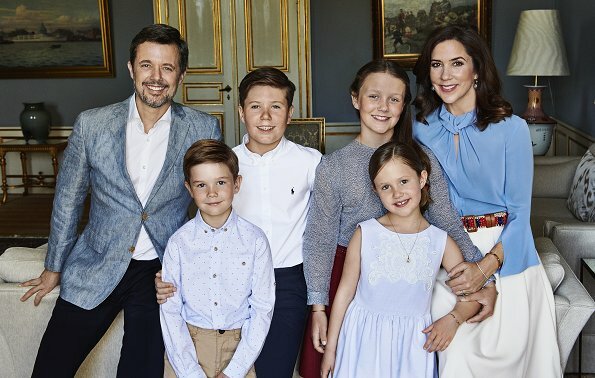 On the occasion of the birthday, Danish Royal Court released a new family photo showing Crown Prince Frederik, Crown Princess Mary, Prince Christian, Princess Isabella, Prince Vincent and Princess Josephine. Beautiful color coordinated family portrait. Prince Frederik looks really good here. A beautiful and lovely family! Beautiful blouse on Mary, everyone has a big smile. Good looking family. Amazing how much Isabella resembles her Grandmother, Queen Margarethe. And Christian looks very much like Frederick. Beautiful family. I adore this blouse, this is a very difficult color as it can become a little prissy, but the twisted neck line and sleeves, make it very original. The belt is sublime!! Lovely. wat een heel leuk gezin ,en knap om te zien .!!!!! Beautiful family portrait! Mary’s blouse is gorgeous! Lovely and happy family! Seems that they have much fun together! Mary looks gorgeous in the blue blouse.